These roasted root vegetables are a delicious and healthy alternative to roast potatoes for your Sunday lunch. This meal when served as four portions provides 161 kcal, 4g protein, 20g carbohydrate (of which 15g sugars), 7g fat (of which 1g saturates), 13g fibre and 0.3g salt per portion. Cut the vegetables into chunks approximately the same size. Toss all the vegetables with the olive oil and put into a large roasting tin. Top with the thyme sprigs. Bake in the oven until tender, about 40-50 minutes. Sprinkle with sea salt and serve at once. 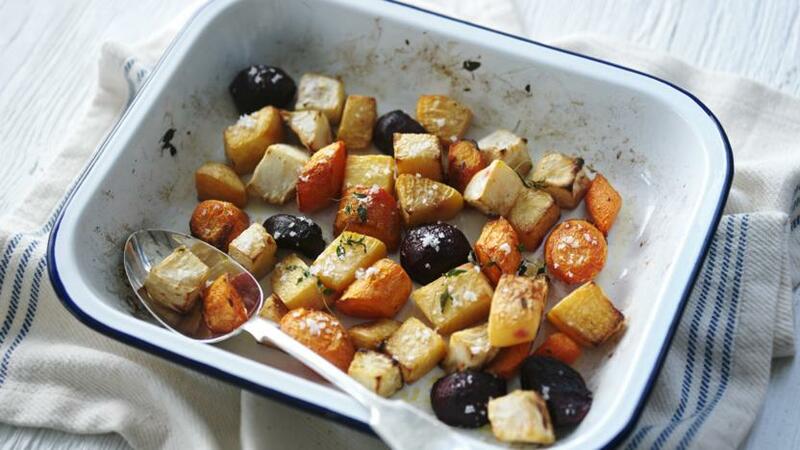 Make a tray of roasted root veg whenever you have the oven on. Keep in the fridge for three days to use in cous cous, frittatas or blend into a soup.